The app - which is just a fun project and shouldn’t be taken too seriously - is like a stopwatch for meetings. 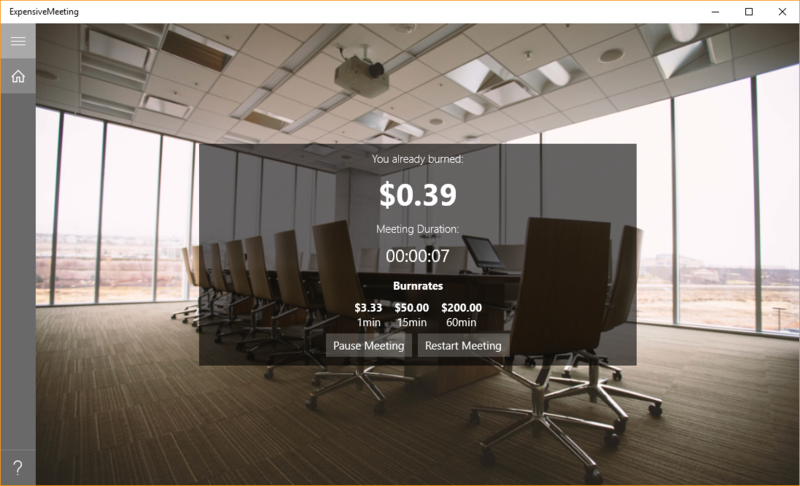 But instead of the pure time it shows you also the burned money for your meeting, because time is money, right? Don’t worry: The app is free and no ads are shown. The app itself is a UWP app, which means it runs on Windows 10, Windows IoT, Windows Mobile 10 (or is it Phone?) and maybe in the future on Xbox One. To see the app running on my phone, without touching the code at all, was pure fun. I really like the UWP approach. Starting from scratch can be fun, but to shorten the development time I used the nice Template10 template, which gives me the typical hamburger app layout. The project can be found on GitHub and has a very active community. I decided to work in the open on GitHub, so if you are interested on the actual code, just take a look and do whatever you want to do. If you have ideas or found bugs I would appreciate your help: Just create an issue or send a pull request.